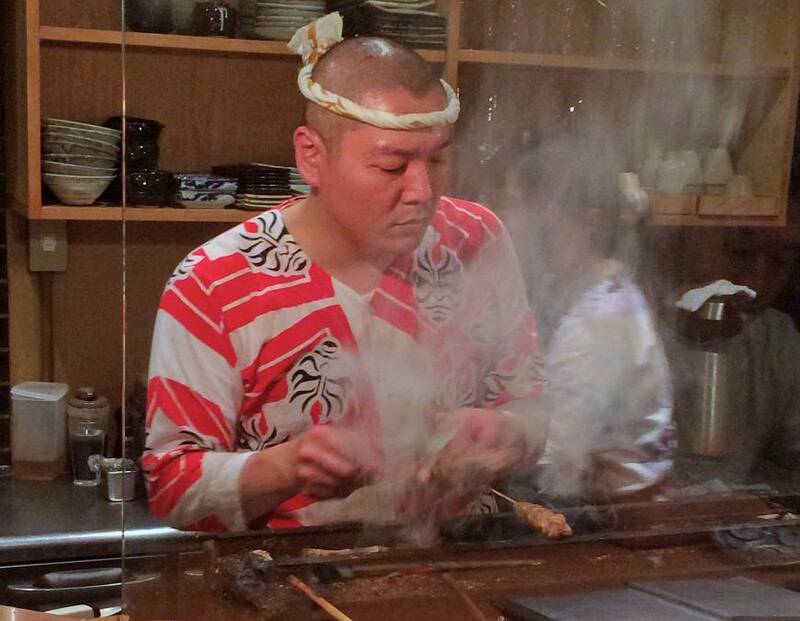 There’s no mistaking the kind of cuisine offered at Yakitori Ogawa. All 15 seats in this compact, one-counter grill look directly onto the open kitchen where skewers of premium poultry are slowly, carefully tended to over glowing charcoal. Both the look and the location are classic. Ogawa lies in the heart of Arakicho, a small but long-established nightlife center just to the west of Yotsuya. Just two years old, it’s still a newcomer. But it fits in perfectly, with its noren curtain in front of the sliding door and the colorful tunics worn by the grill master and his crew. However, Ogawa is not rooted in the old ways. 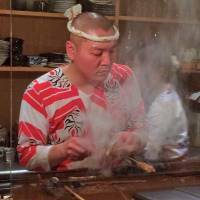 Instead of following the standard izakaya (traditional tavern) mode — where customers linger all evening, drinking and ordering yakitori a few sticks at a time — it operates more like a sushi or tempura restaurant, with a fixed menu and tempo. Once you are in and seated, you can relax, lean back and wait for each course to arrive. Just as a high-end sushi feast invariably opens with appetizers — often sashimi, but also cooked fish dishes — the meal at Ogawa follows a similar pattern. After a tray of zensai (appetizers) to prime the palate, the first course is served: tori-sashi (chicken sashimi). The platter will feature slices of sasami, the lean, tender meat from the inner breast, together with fattier chunks of breast meat (mune), and also slivers of chicken heart (hatsu). On the side, you will find grated wasabi, a wedge of lemon, a saucer of salt and a soy sauce dip. The chicken is superbly fresh. It comes from a heritage breed of gamecock known as Amagi Shamo, raised on the Izu Peninsula, and the flavor is outstanding. Order a round of sake, just as you would with fish sashimi, and savor the contrasting flavors and textures. A small cube of rich liver pate is served, with dark fruit bread. Next, a small green salad. And later on, a steaming bowl of chawan-mushi, a rich savory custard made with dashi stock and plenty of chicken. Then, finally, the first yakitori appear: toriwasa, lightly seared, rare sasami meat with dabs of wasabi; a skewer of gizzards, firm, crunchy and flavorful; classic negima, juicy chunks of thigh meat alternating with lengths of leek; and tsukune, a long patty of ground chicken. Interspersed with these are slices of beautifully browned zucchini, delicate young shishito peppers, quails’ eggs and ginkgo nuts. Everything is delicately browned and lightly daubed with a soy basting sauce. The meal closes with rice, pickles and a revivifying chicken broth, followed by dessert. This is a good, satisfying meal and excellent value (¥5,000). Ogawa also offers a light “half menu” (¥3,500) without the sashimi and with fewer skewers. Either way, you can always order extra yakitori if you’re still hungry. And once you are done, there are plenty of bars nearby in Araki-cho, to keep you entertained until the wee hours.